Velvet Art Roll-Up Flowers(PS1397)-Paper items-台州山水工艺有限公司官网,山水工艺,台州山水工艺,仙居山水,台州山水,Taizhou Mountain & River Art and Crafts Co.Ltd,Registered and established in 2006, Taizhou Mountain and River Crafts Co., Ltd is a storage trading company, also is the only one Sino-U.S. joint venture in Xianju County, which was jointly set up by the U.S.-based S&S Worldwide and Xianju Yikai Crafts Co., Ltd. 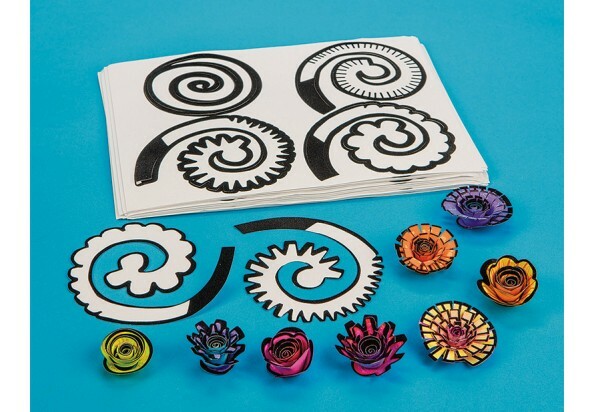 Simply punch out the flower shape, color with markers or crayons, roll it up and glue it to its "base." Embellish crafts or add a chenille stem "stem" to make a bouquet. Pack of 24 velvet-printed 9" x 12" sheets, each with 4 designs for 96 total flowers. Each rolled-up flower measures approx.